Outlook Express Password Revealer, a tool designed by Ridler is a password revealing program which can reveal and unhide passwords in your Outlook Express. It is able to retrieve passwords which may have been lost or forgotten for pop3 accounts, smtp usernames and passwords and nntp newsgroup account passwords. 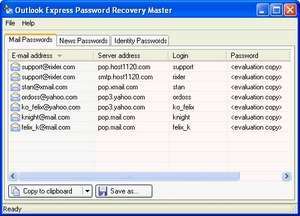 Since passwords are easily lost, this program fills that hole, especially when you're moving your daily use to a new PC. This program is extremely easy to use and works well for modern versions of Outlook Express. Outlook Express Password Revealer 1.1 is a shareware program and can be used as a demo to try the software until the free trial period has ended. A full version of the program is available after the trial period ends. For security reasons, you should also check out the Outlook Express Password Revealer download at LO4D.com which includes virus and malware tests. Additional screenshots of this application download may be available, too.